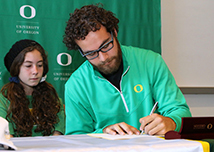 The University of Oregon is proud to announce Signing Day 2015, celebrating the remarkable achievements of this year’s recipients of the Stamps Scholarship. The Stamps award is the UO’s most generous and prestigious undergraduate scholarship, providing tuition, room and board, and access to an enrichment fund that will help recipients pursue study abroad, internships, or other experiences. William attends Central Catholic High School where he is the student body president. He provides color commentary on the school’s sports broadcasting channel and is an ambassador for prospective Central Catholic students. 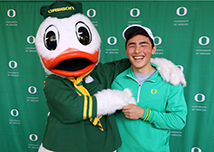 He’s a peer mediator, a varsity tennis player, and has volunteered with the Oregon Special Olympics. He also teaches private guitar lessons and coaches middle school basketball. His volunteer pursuits include working at the homeless shelter in downtown Portland, participating in the Rose City Clean Up, and raising funds for a car-accident victim from his high school. Edward Szczepanski attends Wilson High School where he is captain of the speech and debate team, recently becoming State champion in two events: Impromptu and Extemporaneous speaking. 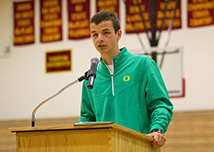 He is the Model United Nations club leader at his school, and was one of five Under-Secretaries in Oregon. A weightlifter, Edward played football and participated in Wilson’s first-ever We The People program. He has interned at OHSU, a software firm and for an agricultural exporter in Australia. As former president of his school’s Key Club, he fundraised for maternal and neonatal tetanus vaccines and building schools in developing nations. 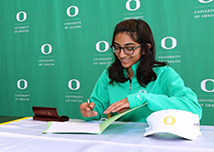 Apoorva Somayazulu is the vice president of the Junior State of America club at Westview High School, where she also organized a Red Cross Blood Drive and a voter registration drive. 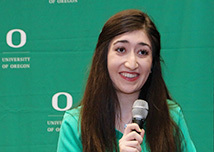 Her volunteer endeavors are many, from chairing the Beaverton Student Advisory Committee, to being a peer mentor to youth volunteers at OMSI, to interning at the Casey Eye Institute at OHSU. She has played violin for the Metropolitan Youth Symphony and created promotional videos for Washington County Library Services. She was the student campaign coordinator and worked to increase voter turnout for the local option tax levy to fund public schools. Joseph attends Ashland High School where he is the team captain for the FIRST Robotics Team, was a founding member of the school’s bi-weekly video broadcast, and was the co-president of the Gender Equality Club. He’s active in Ashland High School theater, was selected by his principal to be the keynote speaker at the Evolving Education Summit on Entrepreneurship, and was a camp counselor at a children’s summer camp. He’s a varsity speech and debate team member and is an accomplished mandolin player. He designed and taught a computer programming workshop for middle school students and served as a counselor for introductory freshman overnight retreats for new Ashland High School students. Elmira Louie was just named the valedictorian of Elmira High School. She is the editor-in-chief of the school’s monthly news magazine, where she also is the president of the Key Club and is a student leader of the Tolerance and Diversity Group. She’s served in Student Government, was the statistical software engineer for the school’s wrestling team, and was named a Fern Ridge School District Distinguished Community Builder. She’s an avid artist and is the winner of numerous awards in Advanced Placement coursework. She is the student adviser on the City of Veneta Park Board and regularly volunteers her time on service projects for hunger issues in Lane County. Ravahn attends the International School of Beaverton, where he’s the president of the Model United Nations Club and the vice president of the Interact Club. He holds other leadership positions as well, from Basketball Club to National Honor Society. He founded a Skills and Drills Basketball class for kids in his neighborhood, which has been successfully running for three years. Ravahn was a lab research assistant at Brooks Army Medical Center and Legacy Research Institute, and founded a blues jam group with several musicians in his community. He’s a math tutor and a frequent volunteer at Oregon Food Bank and Kaiser Westside Hospital.